The new products release time of LIMITLESS (called LMC below) always attract a crowd of followers due to its edge-cutting design. Appearance has always been an killer of LMC to surpass other products, and the coexistence of its actual functionality and edge-cutting design is also the reason why it’s liked by players. No matter in which period or place, the military style will never be out of fashion and can attracts lots of followers. 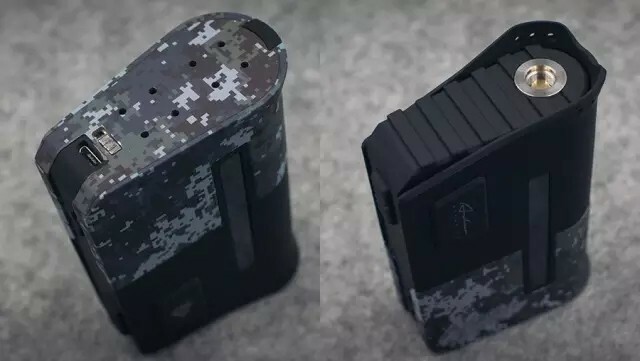 Recently, LMC released a box mod ARMS RACE powered by dual batteries of big power and based on the design element of “bullet box”. Here below I will bring the actual usage experience of this mod to you. 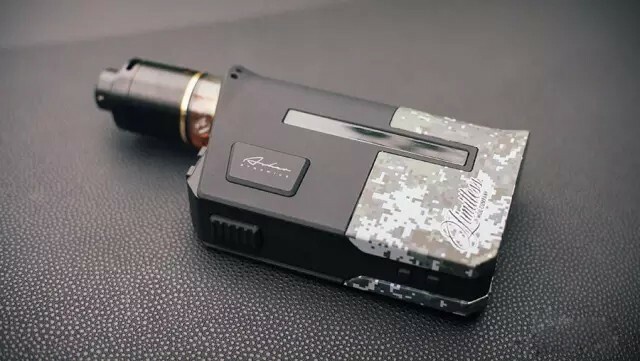 The package of Limitless ARMS RACE 200W box mod adopts the style of hat box. The wide range of gilding Medal pattern really shines the eyes. The back is printed with some information of the LMC brand but without detailed specifications. Since the one I have is just a sample of it, there is only a mod with a brand card, in the package, none any spare parts. The mod is painted with rubber paint, giving it really nice hand feel. The whole shape of it is very close to the bullet box of ruffle. The camouflage pattern of the bottom attaches a shining point to its appearance. No relative materials has been published officially. The light body should be made of plastic. There is completely no pressure to carry it around. The black part on which side shows the sign of LMC is the screen. The screen of the mod is a little bit dark. The two sides of the small cross section are processed with the shape of semi-circle and square separately. On the semi-circle side, there is a gilding medal pattern for decoration. On the square side, there is the switch and adjusting buttons. 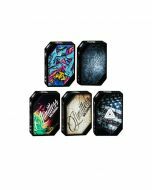 In the light of the hand feel, the ARMS RACE 200W box mod is of very good quality. 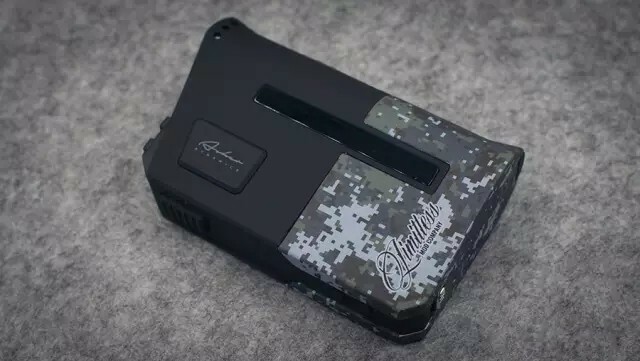 The camouflage pattern part at the bottom is the lid of battery compartment, adopting the light-weighted alloy material. On the side where the eight pressure-releasing holes is on, there is a switch-pusher of the battery cabin. 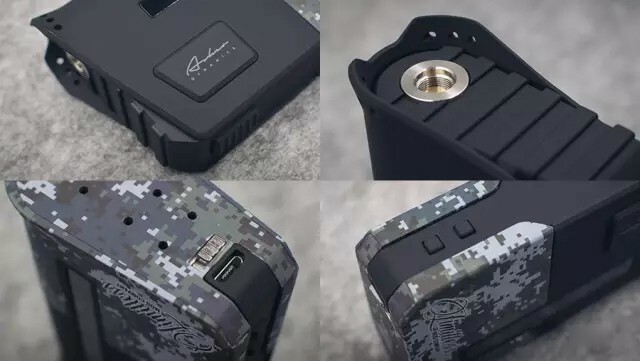 The lock of ARMS RACE 200W box mod’s battery adopts the way of clamping but not strong magnet, further simulating the operation of military bullet box. The USB port is on the side of the switch and can realize the direct charging of the box mod. The 510 thread on the top adopts the gold-gilded spring electrode, but at the connection, there is none integrated scabbing-proof plate. If it is in long-term usage, unavoidably, there will be scratches. The concave-convex on the top and the oblique petal pattern by the 510 connection both fortify the military style. As for the workmanship, you can hardly find faults or weaknesses. There is a reasonable assembling gap between the “510”connection and the top of the mod. Though the gap is not caused by faults of workmanship, it will have the problems of stocking dust or liquid. Once there appears such problem, it will be hard for cleaning. 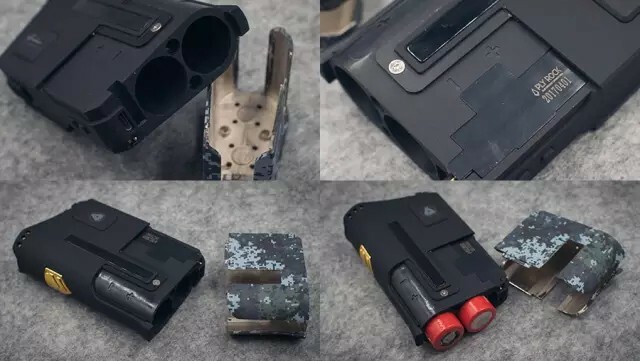 When the lid of the battery compartment is pushed in, it will connect with the mod perfectly. The buttons of the mod are all of light elastic force. The camouflage paint is the rubber paint. 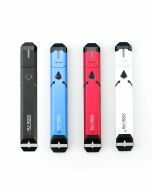 Though it can give the mod a nice hand feel, it can easily have the problem of peeling off. This is the defect of rubber paint. When you open the lid of the battery compartment, you can see the thoughtful design for the positioning of the lid—two round holes. When you install the lid, you only need to push up the lid. When you hear a slight sound of “click”, it indicates that they match well. 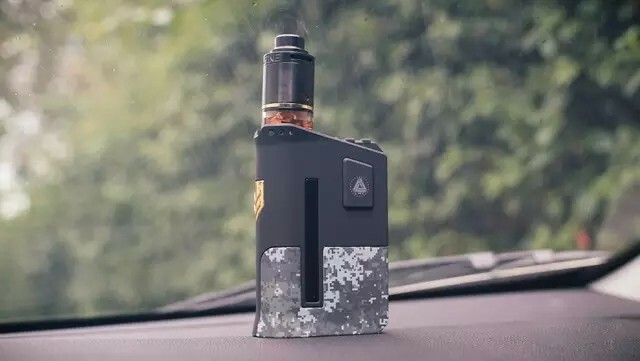 In all the aspects, this ARMS RACE 200W box mod imitates the real military device and gives a feeling of military experience. The mod can match tanks of 25mm diameter maximally. On the appearance, there is nearly no edge exposure problem due to that the petal-shaped arc plate can encircle the atomizer in it. When using the fire button, the slide proof combining the rubber paint gives the mod very good hand feel. Every click for firing is very crisp. 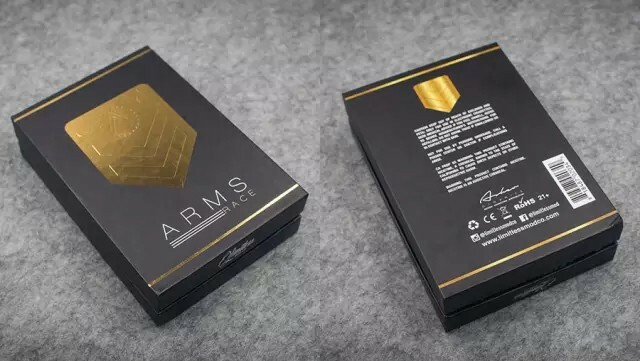 The ARMS RACE 200W box mod adopts the chips that is costumed for LMC. The operation of such chips is of slight difference to those in the market. Users will need some time to adopt to it. Here I will give you a brief introduction of the key combinations. 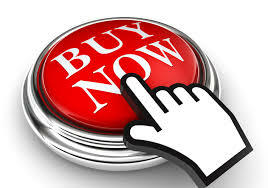 1.Click the fire button five times to switch on/ off the box mod. 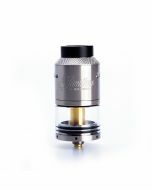 2.The mod will automatically recognize the resistance, and the new atomizer will indicates the choice of new or old. Adjusting the button to switch between them and press the fire button to confirm it. In the TC mode, when you install the atomizer of A1 coil. After recognizing, the mod will default back to the Wattage mode. 3.If you press the two adjusting buttons simultaneously, you can lock or unlock the wattage adjusting button. 4、 When you press the “+”button and the fire button simultaneously to step into the mode selection situation and when you press the adjusting button to chose the mode, the mod will switch between the “Wattage Mode”, “ Autonomous TC Mode”, “Automatic TC Mode”, and you can press the fire button to make confirmation. Under the wattage mode, the mod can be adjusted to 200w maximally. For the moment, there is none relative information illustrating the supporting range of the minimized resistance. I installed a A1 RDA of 0.09 Ω and found out that it could be used with this mod. 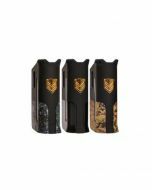 As regard to the firing performance of the mod, ARMS RACE 200W box mod has no firing delay problem. 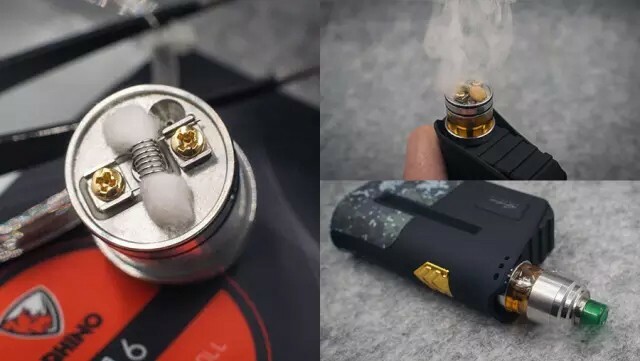 Under the low resistance of 0.09Ω and the balanced wattage of 150W, the performance can be described as firing if you pressing. The heating stability is good. 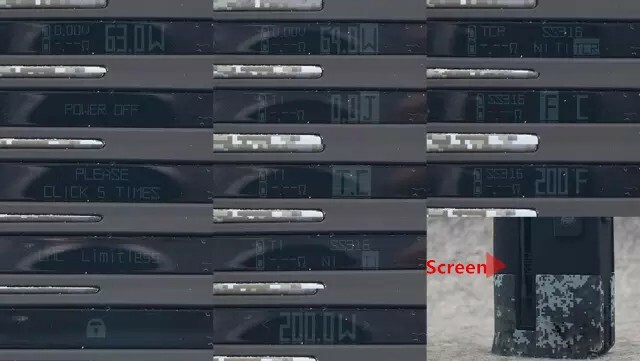 Though the TC mode has become common after being a flash in the pan for a while, this mod still remains the TC mode and even sets two different types of TC modes. Since this mode doesn’t have official instruction, here I will give some brief instruction based on my usage experience. 1. 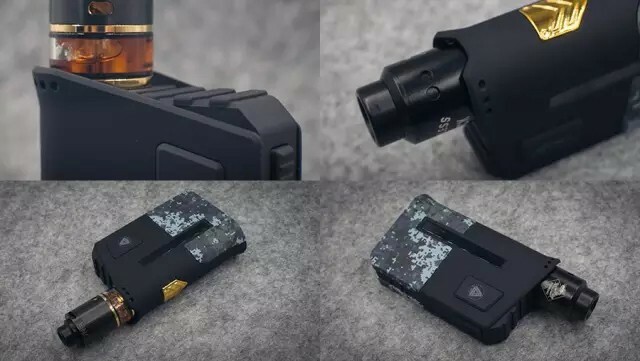 When you switch the mod into the TC mode with the J logo, the mod will indicate to choose the material of the coil (NI/SS316/TI) before getting into the mode. When getting into the mode, the mod will completely get into the automatic situation. When you fire the mod, it will automatically match a proper J value corresponding to the resistance of the atomizer. When in this mode, the mouth feel will be soft. For the test, I used the atomizer of 0.4Ω single coil, the mod automatically matches a heating wattage of 20-30J(you can not adjust the resistance manually). But the actual situation of this function needs to be introduced officially. This time is only a simple experience. 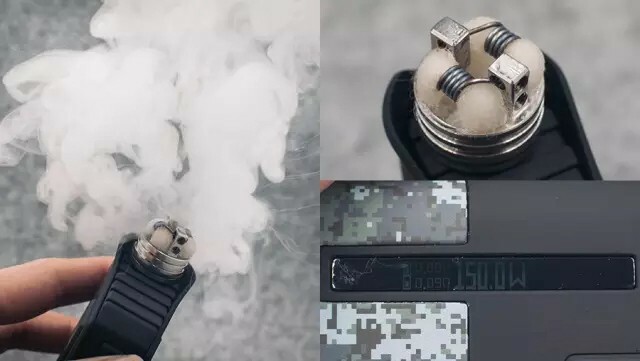 2.When you switch the mod into the TC mode with logo “TC”( namely the common TC mode), before the mod gets into the mode, you will need to confirm the wattage, the material of the coil (NI/TI/SS316/TCR) and the temperature, then the mod will get into this TC mode. The way of using it is of very little difference to that of the common TC mode. Users can set different specifications to change the mouth feel. 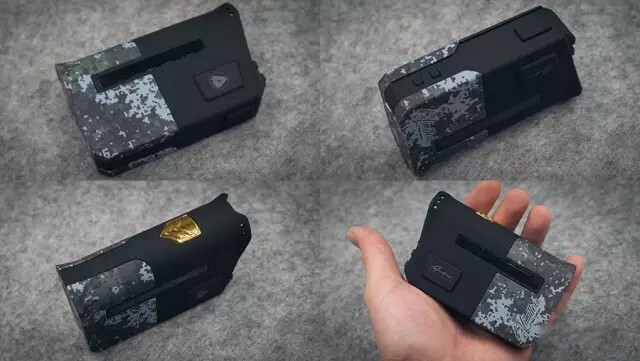 LMC adopts the military style to design this ARMS RACE 200W box mod, and uses the chips with satisfying performance to make it not cool in its appearance. 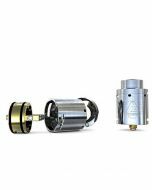 In today’s competition of mods, besides the chip performance, overall quality, simple operation, players also need some “cool” products. LMC is such a product targeting these products. But whether on earth you will place an order on this product, it will depend on whether you can resist the charm of the military style. Warm Hint: Since every one has different usage experience, this article will only represent the point of view of the author. For reference only!